Everywhere you look in the vast ancient Mughal Empire territories, you will find a monument that was constructed by Shah Jahan. It seems that the Mughal Emperor had a soft heart for the beautiful things. One such monument is the Red Fort Complex that was built as the Palace fort of Shahjahanbad. Everywhere you look in the vast ancient Mughal Empire territories, you will find a monument that was constructed by Shah Jahan. It seems that the Mughal Emperor had a soft heart for the beautiful things. One such monument is the Red Fort Complex that was built as the Palace fort of Shahjahanbad. It was to be the new capital of the 5th Mughal Emperor of India – Shah Jahan. The fort is named after its massive enclosing walls of red stone. Amazingly, you will not only get a chance to explore the Red Fort, but also the adjacent Salimgarh Fort that that was built by Islam Shah Suri in 1546. The two forts make up what is today known as the Red Fort Complex. The Red Fort comprises of private apartments that feature rows of pavilions that are connected by a continuous water channel that is known as the Nahr-i-Behisht – this name is literally translated as ‘Stream of Paradise’. Through the Red Fort, the Mughal Empire creativity was finally refined. A lot of credit goes to the Emperor Shah Jahan who is seen to have been the patron of all the great Mughal monuments that remain today including the Taj Mahal and the Agra Fort. 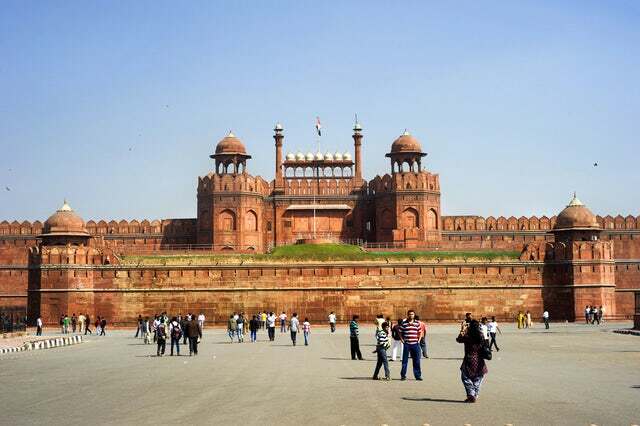 The planning of the Red Fort is characterized by the Islamic Prototypes. Each of the pavilions reveals some elements of Mughal architectural genius. A Persian, Timurid and Hindu inflection is found in some places of the fort. The overall innovative planning and architectural style would later influence buildings as well as gardens in Delhi, Agra, Rajasthan and even beyond the Indian borders. If you are a photography buff, come prepared with some extra memory cards. If you love romantic walks in beautiful gardens, bring your best sundress and sandals. If you love seeing beautiful artifacts, come prepared to be ‘wowed’. The Red Fort, just like the Agra Fort and Taj Mahal makes you wonder how the Mughal architects could be so ahead of their time. Oh, and there are some history lessons to be learnt too. If pay attention to the heavily accented tour guide that will be taking you around, you might awe your friends back in the west with your knowledge of Indian history.